January’s competition will ‘force the issue’ of High Dynamic Range or HDR. You can resist all you care, but the forces of technology and digital manipulation are poised to wear us down to their will……..I suppose I shouldn’t be so dramatic, but I couldn’t resist! High Dynamic Range is the capture, and merging of two or more images for the purpose of portraying scenes as it appeared to the eye at the time of capture. At least that’s the way I’m telling it, and I’m writing the blog!! This doesn’t have to be especially difficult. It is possible to take advantage of “layering” images and ‘erasing’ portions of upper layers to expose portions below that have the correct tone and exposure at one extreme of the visible range while leaving portions of the upper layers that have the correct exposure for mid tones and the ’other’ extreme of the visible range. That can be a tedious, but effective way to achieve HDR. Luckily, there are millions of people with not much else to do but write software. Watch out! There everywhere you turn! Some of them have an interest in digital imagery, and have resolved the tedium of layering and erasing to achieve HDR. Bless them. Now, if they’d stop writing ’apps’ for the dopes too thoroughly preoccupied with their Iphones! Adobe Photoshop CS$$$ and Corel Paintshop Pro have HDR functionality built in. Photoshop is quite expensive. Paintshop Pro is much less expensive, and their HDR functionality is not overly well developed. There are options. Picturenaut is a freeware (or ‘donation ware’) package that’s been favorably reviewed. Jump onto the link below and look over the developers presentation. Another product is FDR Tools (http://www.fdrtools.com/fdrtools_basic_e.php). FDR is not as robust as Picturenaut. It also happens to be the one I bothered to download and use. Since I move slowly is the Ethernet World I’ve not bothered to test Picturenaut. So, what I’m about to demonstrate is what you can do with number two….I mean the second best of the freeware stuff, not the other ‘number two’. The first thing you need is two or more images of the same subject. One image should be exposed to capture shadow detail and the other highlight detail. It’s a good idea to have a third image exposed for the mid tones of the scene. I have three images from our 2007 Campobello trip. One image was underexposed by one stop (should have been 1.5) to grab the highlights. A second image was overexposed by one stop (should have been 1.5) to get shadow detail. 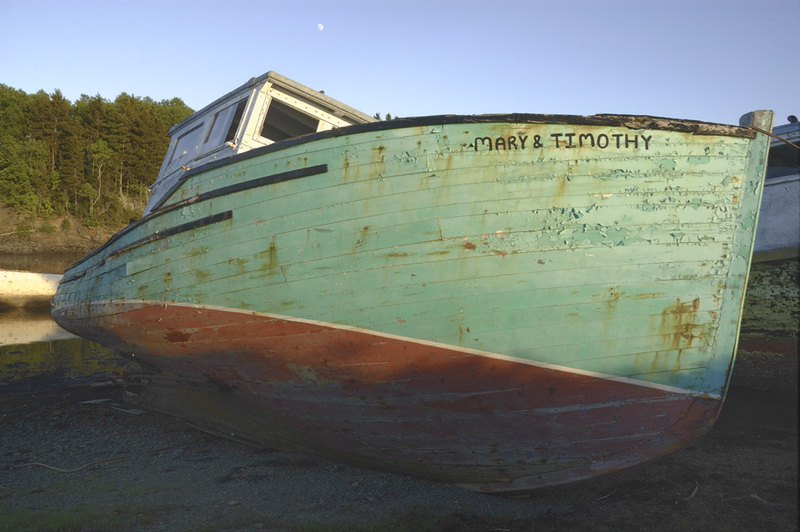 The third was exposed for the mid tones on the boats hull. My first step is to boot up the FDR software. I’m greeted by three windows. The larger of the three is the one of interest at this point, because here I can tell FDR to fire Harry Truman…..oh, dear! I’ve wandered off again….. I can click on the Projects menu option and select Create New Project. I then naviga te to the folder where my subject images reside, select them and click ‘Open’. FDR does not have a progress bar. So, you do not know if anything is happening for a while, but the software does work behind the scenes. Much like the kitchen help in my future mansion after Cyndi hits Powerball. That assumes Cyndi won’t toss me into the kitchen to BE among the kitchen help. es in this window and clicking Edit, FDR’s kitchen staff toil quietly away. After a time FDR spits out a tone mapped image in the mid sized window to the one we’re working in. If you click on the Align button, FDR will evaluate each of the three participant frames and adjust them for a best fit. Once the alignment is done click on the Save button. Once you’ve given the image a name and click OK, a substantial amount of time lapses before the kitchen help gets the ’pie out of the oven’! but you are done with the HDR effort. Give one of the freeware/donation ware HDR software packages a shot. The process can be as simple or complicated as you want, but not necessarily expensive! photographs of these often photographed subjects. I have a few stages of moose photography. 1. Brain dead! A Moose - get a shot! These never come out but you have the shot for a record. 2. Where is the light and what is the background? In a boat I can move the boat for both questions. 3. How close or far away do I want to be? My goal used to be only to get close. Now the goal is to show the moose in her environment. This is difficult when shooting a moose in the road. A boat allows you to have a good background. position in the water for the best angle. Canoes are also good for photography, but are larger and are hard to hold steady. They don’t allow low angles but if a moose is on a bank they do allow a higher angle. They also have more room. I keep thinking I need an electric motor. I will let you know how it works when Santa gives it to me. Your camera will also need some protection as well. If traveling in a smaller boat that can possibly tip or flood,you will definitely want a waterproof case for all your gear. I usually keep my photo gear in a roll top dry bag from Beans. I leave the dry bag open when photographing on calm water, but seal the top whenever I am getting in or out of my boat, or when the splash from the paddle might get on the cameras. Often I wear my fishing waders so I can get out of the boat. I bring my tripod. I always use the tripod in a canoe. Sometimes in the kayak. Often if the bottom is not too mucky I take record shots in stage 1 and then get out of the boat with my tripod for stage 2. I have sat on the outside of my kayak in shallow water with the tripod in the pond and blood suckers swimming at my feet. 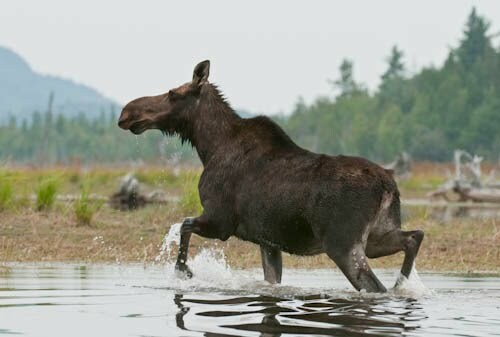 (Why I now use fishing waders) Moose are skittish but when they are feeding they watch and continue to feed. Move easy and you will get your shot. With our first competition a few days away, and fall coming, what better time to think about capturing images! A while back Sally donated some rolls (that's right - film) of Velvia 50 and a roll or two of Sensia. The plan I have is for folks who never used slide film to 'have a shot at it' for the experience. I still have 5 rolls of slide film, and fall color ofteh produces "Velvia" moments. So, how many of you still have a film camera? How many of you with film cameras have not shot slide film before (or just once)? 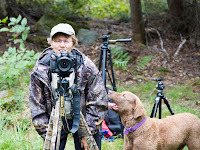 How many of you would like a group photo outing to capture fall color with a 'fading' media? I'm thinking of Leonard's Mills during Living History Day's October 2nd or 3rd; or maybe a hike to Little Wilson Falls or Borestone Mountain. Please let me know if you are interested. Penobdon28@aol.com. Speaking of trips.....are any of you interested in going to Quebec City during Winter Carnival??? Let me know about that too! Don't forget to register your images for this Thursday's competition. The Bangor Fair holds a photo contest each year which is run by the volunteers from our club. Although we run the event the judging is done by paid professionals that have no affiation with the club. Planning and a history of successful events are the key to pulling this off. There are several months before the event that are spent in meetings, planning, and gathering the resources needed. The actual event takes three or four nights of hard work. We used to do it in four separate steps (nights) but we have now combined two steps into one long evening. Accept entries and fees, check entries for compliance with rules, log entries, sort into categories, assign tracking sequence numbers, prepare for judging. Judge the entries, display a category at a time allowing the judging panel to pick the 10 best for scoring. One by one score the prints that made the first cut. Two score keepers are used one using a computer the second recording the scores on paper as a back up to the computer. The winners are calculated by the computer. If prints have duplicate scores they are reviewed by the judging panel and the final determination for ribbons is done. Winning prints are taken to a station where volunteers record the prize, make up the ribbon for the print. Hang the prints for display during the up coming Fair. While the judging is being done prints that have been judged are brought to the display area of the convention center and a team of volunteers arrange and hang the prints. Once the Fair has opened volunteers periodically check the display and keep it maintained. The Monday after the Fair closes volunteers take down the display and distribute prints, ribbons, and prize money to the contestants. After a sigh of relief we have a wrap up meeting to discuss what went well and what may not have gone so well. All this is documented for the next year's contest. 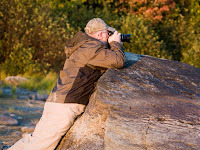 Well it is the end of a year for the Eastern Maine Camera Club. We start up again with regular meetings in September. I am taking over as president for the coming year so I will be attempting to expand our use of social media for communications. This will include more updates to this blog, expanding the facebook group members, and trying to get a better handle on our email list and how it is used by the members. Over the summer we have one major project which is the Photo Contest for the Bangor State Fair. We run this contest for the Bangor Fair. Things are pretty well ready, we have posted the rules and regulations, we have hired judges, and we have the work crews ready to accept, judge, display, handle awards, and return the images that will be part of the contest. We are expecting about 800 entries this year so it is a lot of work but very rewarding as it furthers our interest in helping others with their photography. Kevin Doyle has jumpped into our blog this month. What does a Mainer do on the coldest morning of the winter? Why, go to thebeach of course. Single digit temperatures afford all sorts of benefits: Noflat-landers or strap-hangers, no annoying traffic, no gate keeper tocollect a fee, plenty of parking and the ice cold beverages stay ice cold.On a frigid January morning even the ocean feels warm (relatively speaking).And the beach would be clear for shooting without those annoying obstructions; people. It's a plan; we're headed to Lamoine State Park for a photo shoot. The next question is what to bring on this pre-dawn outing. Extra gear isnot only a good idea, it's a must. Unfortunately, in the rush to beat the winter morning crowds, a few (minor) items were overlooked and left behind. One being a battery for the Nikon D300 and another being the memory card for said camera. Luckily the D50 was packed along with a weakly charged battery. Hmmm - not the best scenario for sunrise in 4 or 5 degree (batteryzapping) temps. After only a few photos the 'low battery' warning was on. So, back in the truck to warm up; both photographer and battery. Leaving the camera outside to avoid condensation and the battery safely tucked in an inside pocket, we waited. Both photographer and battery survived over two hours of shooting in singledigit temps. Even the snow in our shoes wasn't a problem - it never had achance to melt and dampen any feet. And the tri-pod allowed hands to spendas much time as possible in warm pockets. One last precaution - before settling back into the warm truck, storing the (almost frozen) D50 in a plastic zip-lock bag to reduce condensation once the shoot was done. There are a couple of lessons to be learned here though. Check equipment, check the timing of the sunrise and (did I mention?) check equipment. Kevin and Marsha, thank you for your contribution. I'm looking at a print I submitted to a recent club competition. It received a modest score. I expect the score was deserved, but I really should learn how to stuff ballot boxes. Any of you from Chicago? Anyway, I can see a number of failings in the composition. It seemed like a nice idea at the time, but you can't spend several months at a shooting location to decide if a shot is worth the effort. Two years and some months removed from the capture of this particular image I can see some compositional improvements. "Move the camera to the right a bit, and up a little." Yes, there is a nice diagonal there, and some color, but I cut the diagonal off too early and left some drab vegetation on the left side of the frame. Now, why am I bringing this up? Well, it's been weeks since I've blogged anything......not a good enough reason for you? Would you believe I believe in the moment? I can recall a photographer saying the image has to 'grab you'. Well, I startle easily. So, being grabbed is not high on my list of experiences, but waiting for the calendar to change before shooting is beyond my patience. So, my compromise is to look things over for a few minutes and to capture it whether it grabs me or not. I've accumulated a number of slides and image files that are pretty shakey compositionally. I've spent a few hours recently going over slides taken a few years ago and weeding out some highly doubtful shots. This far removed from 'the moment' makes the 'circular file' a more inviting target. I don't feel that bad about throwing away several dollars worth of film processing. My recent Marden's purchases have eclipsed the film expenditures. Those shots just don't stand up to my perception of what makes an interesting scene in 2009. Luckily, the scene I'm looking at can he captured again later. Maybe it will be better the second time around! Speaking of scenes, I'm open to some ideas for day trip suggestions. I've brought up an idea for a big weekend trip to the Philidelphia area in the spring, and there are some Clydesdales in Lewiston too, but it would be good to get out a shoot something other than the empty sardine cans piled up in the back of my truck. If you sense some desperation, you are fairly close. So, drop me a note if you have an idea or two. trek to Little Wilson Falls. Heck of an idea from one of our members. effort; over preparation and plausible adventure. First, good information. Truthfully, much improvement could be had on the information front. Somehow I reasoned the hike to the falls would be more of a lengthy stroll. This was failed reasoning. Little Wilson Falls is on the Appalachian Trail. In fact, it's part of the 100 mile wilderness. So, why I envisioned a stroll in the woods will remain an unanswered question. As a consequence some of our trekkers didn't have especially good footwear. The weather was rainy in the morning. Some of the members knew what they were doing and brought along water resistant outerwear including pants. Wicked good idea! Wished I thunk uve it!!! Now, reasoned decision making. My guide mentioned the hike to the falls was a bit over a mile. Ha! "Short walk that should be" I said to myself! So, I packed most of my camera gear into a pack and struck out with 35 pounds (plus or minus) of stuff. I thought about discarding an especially heavy lens, but my guide said "take it, you may need it!" How gullible I be, and how he enjoyed exploiting my gullibility. Judgement Section of the club. Little Wilson Falls has tripod holes. There are few views to be had of this impressive cascade. The best views are to be had from a vantage not easily accessed. At least not by me. The sight is excellent. There are shots from above the falls, but you need to get in line for a shot at the falls from below! I expect an intrepid shooter could get across to the other side of the gorge for a full view, or do the 'salmon struggle' right up the stream (not recommended by me). We had the company of hikers passing through. A couple of fellows who looked older than myself basically blew by me without sign of any exertion......don't I hate that! The walk out proved to be the highlight. Apparently there are parallel trails. One is higher up from the Appalachian Trail, which is the one we took on the way in. The Appalachian Trail stayed near the flowage. The stretch from Little Wilson Falls down to the parking lot has many rips and small falls. The foliage wasn't at peak, but it was colorful. We would have made a sight from above with members jagging off the trail looking for shooting opportunities then clamoring back up. It was a very worth while effort. We now know of an excellent shooting location, and have a better sense of how to prepare. The upshot for me is you can never get enough experience. It would be better still if can remember what not to do the next time around. By the way, our guide brought up a winter snowshoe adventure. How about a trek into Daicy Pond this February???? As an aside, I brought along my F5 (speaking of weight) and my lone roll of Kodachrome 25. The last lab processing Kodachromes will cease that effort in 2010. I saw no reason to wait exposing 36+ frames of this film. It came back earlier this week, and I think photographers (and Kodak) gave up on this film too early. To quote Monty Python: "And now for something completely different." "What happens is, the computer thinks it is being helpful by saving copies of web pages the first time you visit them, then just reloads the same thing from your hard drive the next time you visit that page. It does make those pages load faster, but it doesn't show you updates when changes are made. You need to go back to the calendar web page, then click the REFRESH or RELOAD icon in your Internet browser. In Microsoft Internet Explorer, it's called "Refresh." In Firefox, it's called Reload. You can also get to it by clicking on the View menu item in either browser." So, no excuse for not keeping up with the club calendar! Thank you Joel for this information. Our next competition topic is "Still Life". The competition date is November 19.